Whenever a nontoken creature is put into your graveyard from the battlefield, you may pay 4. If you do, return that card to the battlefield and attach Nim Deathmantle to it. 1/1/2011 Once Nim Deathmantle returns a card from your graveyard to the battlefield, it will remain on the battlefield indefinitely, even if Nim Deathmantle becomes unattached from it. 1/1/2011 Nim Deathmantle’s color-changing and type-changing effects override the equipped creature’s previous colors and creature types. After Nim Deathmantle becomes equipped to a creature, that creature will be a black Zombie, not any other colors or creature types. 1/1/2011 Nim Deathmantle causes the equipped creature to be a black Zombie even if it didn’t return that creature to the battlefield from the graveyard. 1/1/2011 Once Nim Deathmantle becomes unattached from a creature, its color-changing and type-changing effects stop affecting that creature. The creature will no longer be black and will no longer be a Zombie (unless its printed characteristics or some other effects still cause it to be black and/or a Zombie, of course). This is true even if Nim Deathmantle returned that creature to the battlefield from the graveyard. 1/1/2011 You choose whether to pay as Nim Deathmantle’s second ability resolves. Although players may respond to this ability, once it begins to resolve and you decide whether to pay, it’s too late for players to respond. 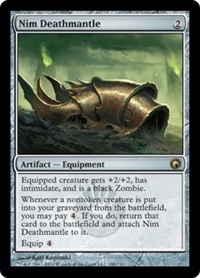 1/1/2011 If the nontoken creature that caused Nim Deathmantle’s second ability to trigger is somehow removed from your graveyard before that ability resolves, you may still pay as it resolves. Even if you do, however, no card will be returned to the battlefield. 1/1/2011 Nim Deathmantle’s second ability may return a card it can’t equip to the battlefield. For example, if a nontoken artifact that’s become a creature is put into your graveyard from the battlefield, Nim Deathmantle’s second ability triggers. If you pay as it resolves, you’ll return that card to the battlefield. However, Nim Deathmantle can’t equip it, so Nim Deathmantle remains attached to whatever it was already equipping (or, if it was unattached, it remains so). The same is true if a nontoken creature with protection from artifacts is put into your graveyard from the battlefield, for example. 1/1/2011 If multiple nontoken creatures are put into your graveyard from the battlefield at the same time, Nim Deathmantle’s second ability triggers that many times. You put the triggered abilities on the stack in any order, so you’ll determine in which order they resolve. If you pay more than once, each card you paid for will end up on the battlefield under your control, and Nim Deathmantle will end up attached to the last card that returned to the battlefield this way that it could equip.